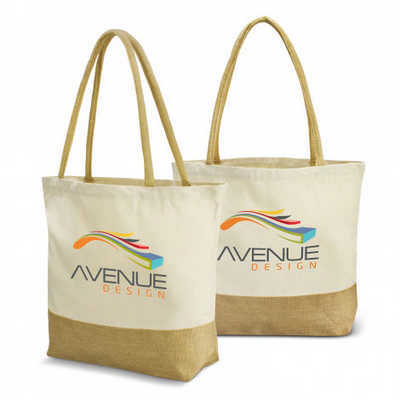 Large on-trend tote bag which is manufactured from a delightful combination of natutal jute and natural unbleached 280gsm cotton canvas. It has a base gusset for increased carrying capacity and long padded cotton handles. Colours: Natural. Dimension: H 375mm x W 360mm x Gusset 100mm (excludes handles). Print Description: 330mm x 180mm. Print Type: Screen Print. Packing: Loose packed. Price includes : 1 Col 1 Pos Print. Setup is included.